I haven't done the Session for a LONG time, but this one caught my eye. It's hosted by James at Beer Bar Band. Topic: Your elevator pitch for beer. "You walk into an elevator and hit the button for your destination level. Already in the elevator is someone holding a beer…and it’s a beer that annoys you because, in your view, it represents all that is bad with the current state of beer. You can’t help but say something, so you confront your lift passenger with the reason why their beer choice is bad." I decided that a person's beer choice isn't bad; I like the way things are going with the current state of beer. But solitary drinking...drinking with someone else is a lot more fun. Hey, I see you have a [whatever beer; it really doesn't matter]. Did you get that down in the bar? Yeah? So...if I can ask, why are you taking it back to your room? Seems so lonely. Bar's full of losers, hey? I hear you...that's pretty much why I'm headed back to my room, but that beer idea, that's a good one. Tell you what. Beer's such a social beverage, and you seem like a sociable type; I kinda hate to see that go to waste. How about we go back down to the bar, and we can talk for a while over some beers. I'll get the next round. It would be a relief to talk to someone other than my phone for a bit, right? Oh, we can talk about whatever, I just like conversation with my beer. Politics, sports, your mother-in-law, whatever. When I go to Europe, I love the way people in bars will just strike up a conversation with you, sit right down at your table, and talk. Here in the States, folks will go into a bar, watch the TV, and never say a word to each other. Seems like a waste of the centuries of effort that went into making beer the perfect drink for solving the world's problems for an hour or two. This is your floor? Well...how about that beer? That's an interesting point. I have no problem drinking alone in a bar, I even bring a book sometimes. But I remember my wife feeling a little offput when we were in Amsterdam in a beer bar and a random guy just struck up a conversation with her/us. It's what you're used to, of course. I've read books and newspapers in bars (I've noticed that the bars in the Czech Republic are generally very good about providing newspapers) and enjoyed that, too. And I recall the first time a German sat down across from me and started eating dinner and asking me about life in America; as you said, somewhat off-putting. But a few days later, I was sitting in a gasthaus having a beer by myself, and a group of Germans invited me to join their table. It was one of the most sociable, convivial nights of my life, and I wound up corresponding with one of them for a few years. I don't insist on conversation; but I do enjoy it. It's not for everyone. 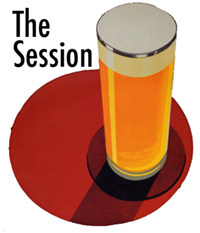 But a lack of it does bother me much more than what beer someone drinks, which was the original premise of this Session. I'll also note that I see a lot more conversation among strangers at brewpubs than in most other American bars. Though there's a lot to be said for small-town bars, if you don't mind a certain amount of curious questions! Happily-married Lew has no idea that he just wrote 30 seconds of "hitting on a stranger in an elevator"! Oh, I was very aware; decided to sidestep the whole gender issue! And...truth be told, I probably wouldn't say anything if it were a woman; too uncomfortable for both of us, which is sad, but true. A guy could equally think you were hitting in him though! It's an interesting topic and interesting to see how people approach it, but I'd never ask a stranger in an elevator about their choice of drink much less suggest that one be shared, it just seems presumptuous and some people would take offence at it I believe. I agree, Gary. The whole idea is nuts, but it's a good opportunity to sound off. On the blog, that is; not in an elevator. I used to have a spot at the local Irish pub in Hawaii where the owner put a special light for me to read next to and would buffer drunk patrons that decided to 'question the girl reading alone." As much as I love drinking great brews at the bar and absorbing knowledge, your elevator pitch would have had me back in my seat for another round. Purely to see what LEW suggested. I'd insist that your wife attend as well of course, she likely has great beer stories as well. Part of what makes this 'beer culture' so alluring is that the people involved in it care, I mean, really care. I adore the take you took on The Session Topic, way to view around the corner! I have a problem drinking alone in a bar..so i always take some one with me..